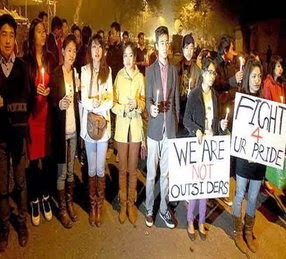 New Delhi, Mar 4 : At least 29 cases have been registered by people belonging to the Northeast living in the National Capital in the first two months of the year, even as Delhi has emerged as the worst city for the people hailing from the region to live in, as the year 2014 saw registration of 286 such cases. Last year was particularly worse for the North Easterners as criminal incidents targeting them have witnessed over 200 per cent growth. In 2013 only 72 cases were registered and the year before that 55 such cases were registered by the police. However, the number of such cases was relatively low in metros like Bengaluru and neighbouring Gurgaon. “In order to contain recurrence of such incidents, the government has directed the security infrastructure to take stringent measures,” said Minister of State for Home Affairs, Kiren Rijiju in reply to a Lok Sabha question.